Launched on the 24th February 2016, Art UK is the new online home for art from every public collection in the United Kingdom. Art UK works in partnership with over 3,000 public collections, the BBC and other organisations to showcase the art the UK owns. All in all it represents a massive collaboration between UK public institutions that own art. The website already features over 210,000 paintings by over 38,000 artists. These artworks are in more than 3,000 museums, universities, town halls, hospitals and other public buildings across the United Kingdom. Most of this art is not on public view. Art UK is the result of a large-scale, privately funded, digitisation campaign, conducted across the whole country by the Public Catalogue Foundation, over the last 10 years. The project initially focused on photographing, cataloguing and publishing every oil painting that the public owns, many of which have never been seen before. The digitisation campaign led to the publication of 90 printed catalogues and online on the BBC website, through Your Paintings. Over the past two years, the Public Catalogue Foundation developed Art UK to take back the ownership of the online resource and in doing this created a platform that radically expands upon the previous offering and creates a new model for future expansion. Art UK put in place a robust, commercial, sustainability model, which attracts online donations and list the names of funders. Over 500 Partner Collections have become stakeholders in the initiative by paying an annual subscription to access commercial benefits. 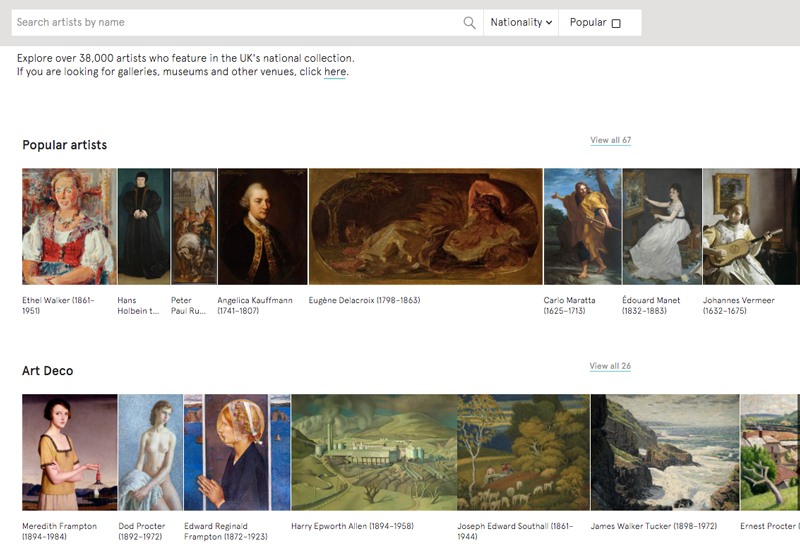 Starting in the summer of 2016, collections will be able to edit and upload new material directly, including drawings, watercolours and other media, through a dedicated Collections Portal. Targeting both specialist as well as non-specialist audiences, the new website features a comprehensive search facility, which merges simple and advanced options within a single, simple-to-use, powerful interface. A sophisticated auto-complete mechanism allows searches to be faceted according to artists, venues, keywords and more. 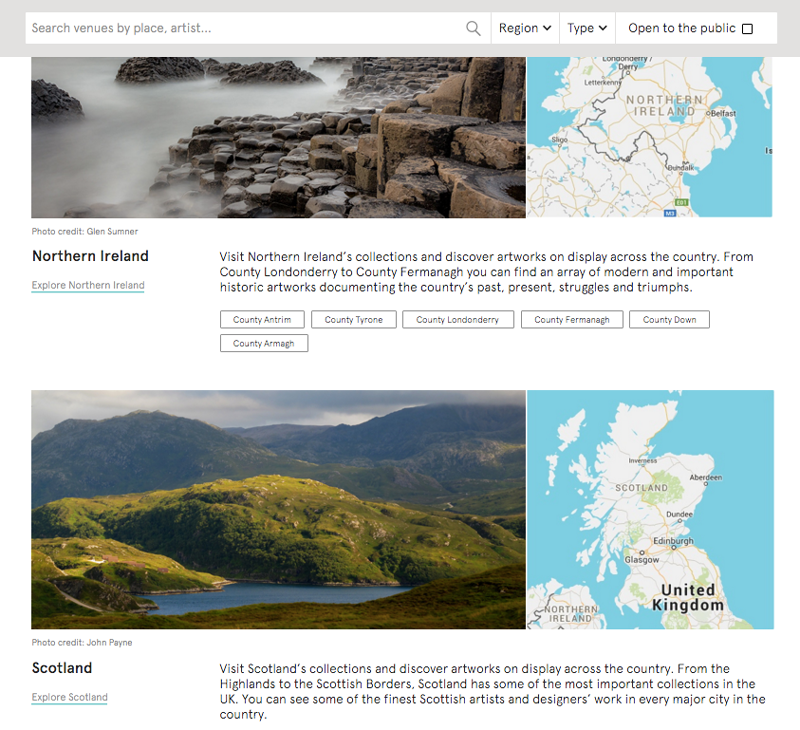 Search is combined with powerful browse capabilities, including a hierarchical index of UK regions, types or artworks, faceted topics, as well as styles. 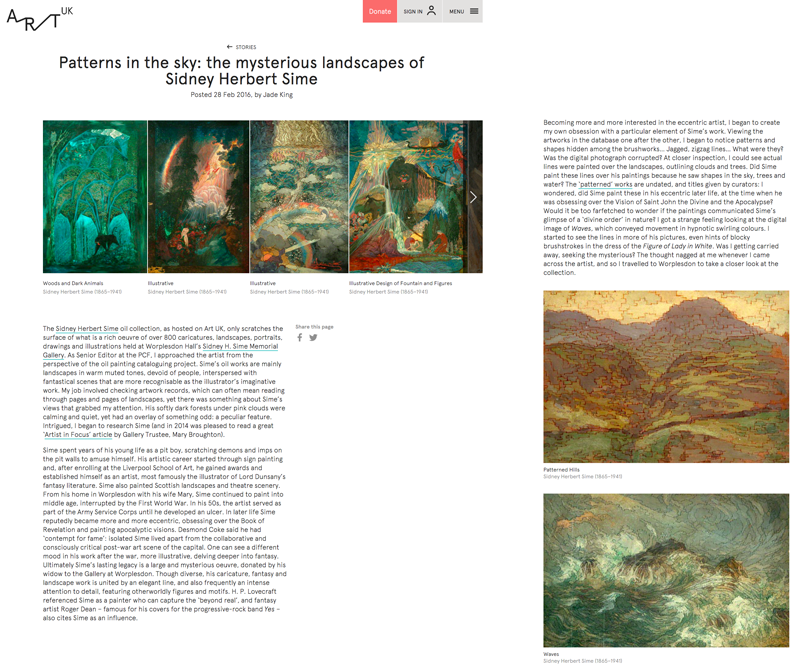 Results can be visualised as thumbnails, as well as on a map of the country – so when (for instance) searching for all paintings by Cezanne (and discovering there are 39) it is immediately possible to see where they are on display. The map is fully interactive and displays all participating venues that are open to the public. 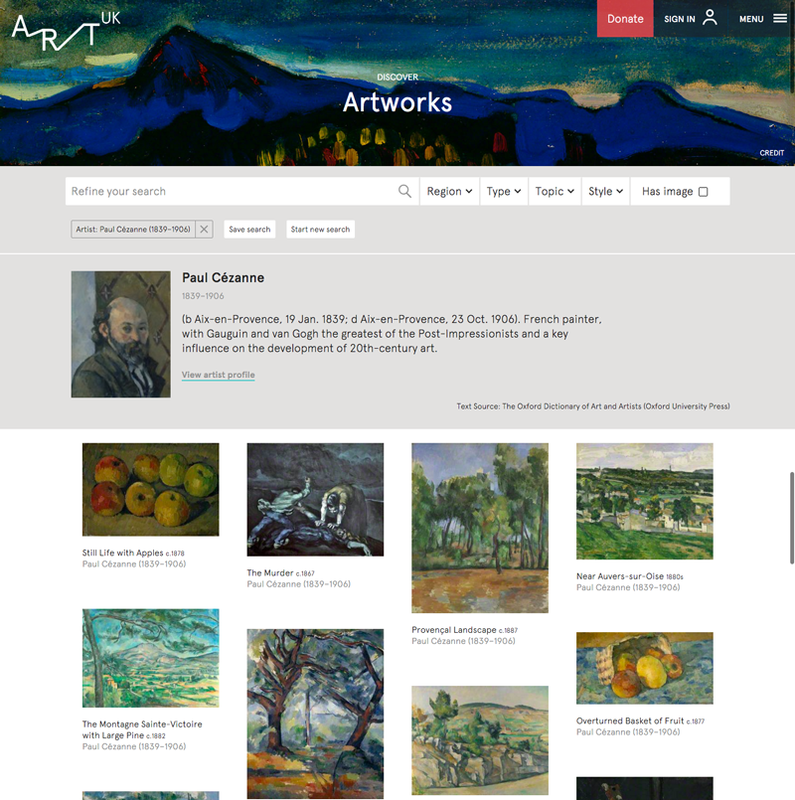 An alternative search option is available for artists http://artuk.org/discover/artists), with filters for nationality as well as styles. Short artist biographies are provided by Oxford University Press, while public library card holders users can access longer biographies from the Oxford Dictionary of National Biography and Grove Art Online. There are also links to artist biographies on Wikipedia, when available. Artists are linked to venues and artworks. The Stories section (http://artuk.org/discover/stories) offers a platform, which allows a wide range of voices including artists, actors, poets and novelists to introduce a broader audience to the stories behind the artworks on the site. Similarly, Topics (http://artuk.org/discover/topics) cut across all content on the website, including artists and artworks, but also venues and more. The Visit section offers full visibility of the over 3,000 locations that contribute to the set of artworks. They can be discovered as a list, or on a map, and filtered hierarchically by regions and sub-regions (from broader to narrower), as well as according to which ones are open to the public. Regions are also curated content, with specific information available at each level of the hierarchy (e.g. England vs Yorkshire and the Humber). Each region includes a map with locations, as well as related artworks, events, topics and stories. 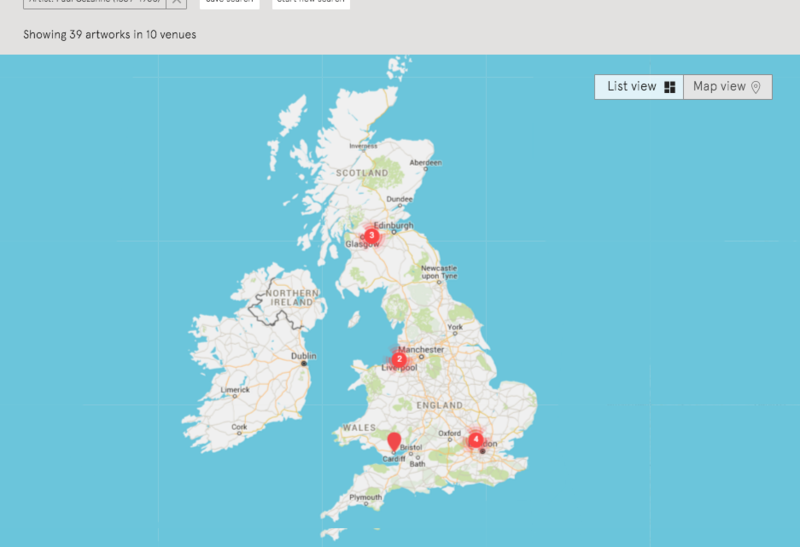 The What’s On section promotes events that occurs at participating venues, across the country, with content aggregated directly from Culture24 (http://www.culture24.org.uk) through their API. 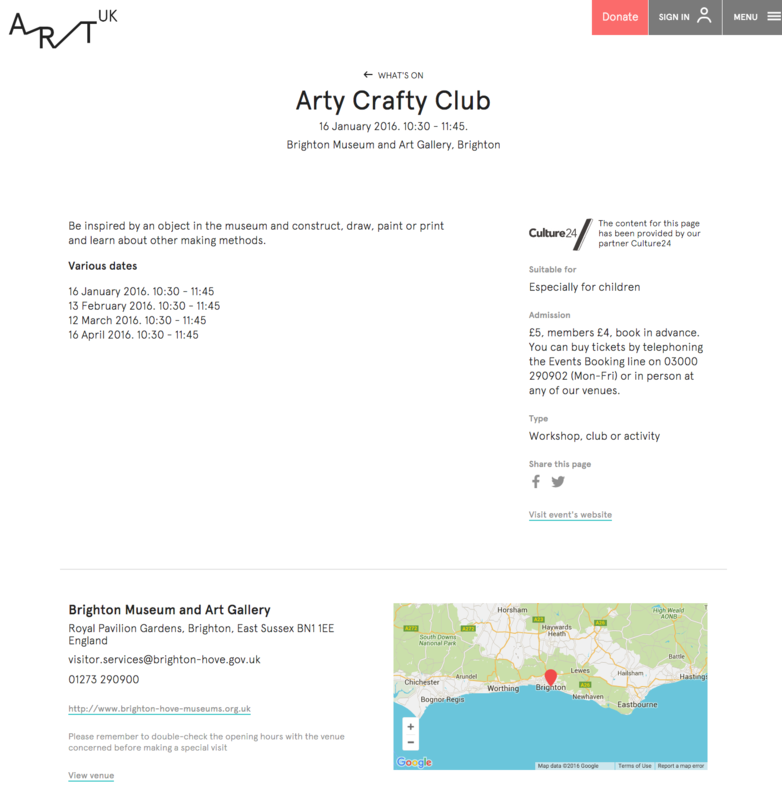 Art UK offers online visitors the possibility to register and create a profile. Registered users can save searches, create and save portfolios of artwork, and annotate individual objects. 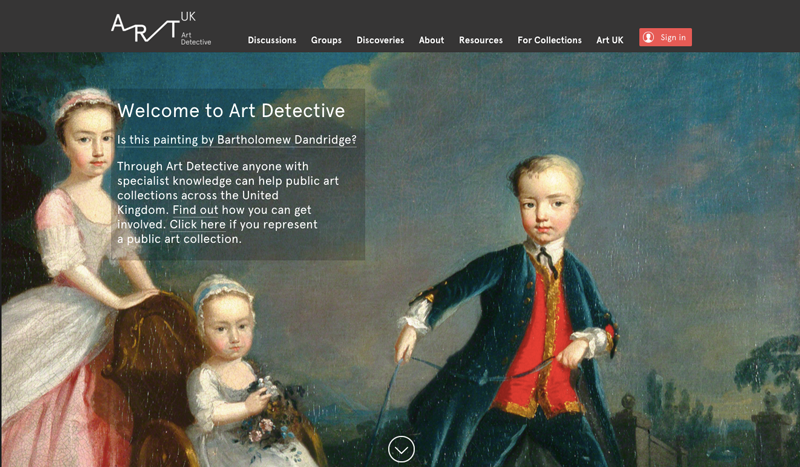 Art UK Tagger and the multi award winner Art Detective (Best of the Web 2015) are now fully integrated with Art UK and share the same technology platform, as well as the user base. 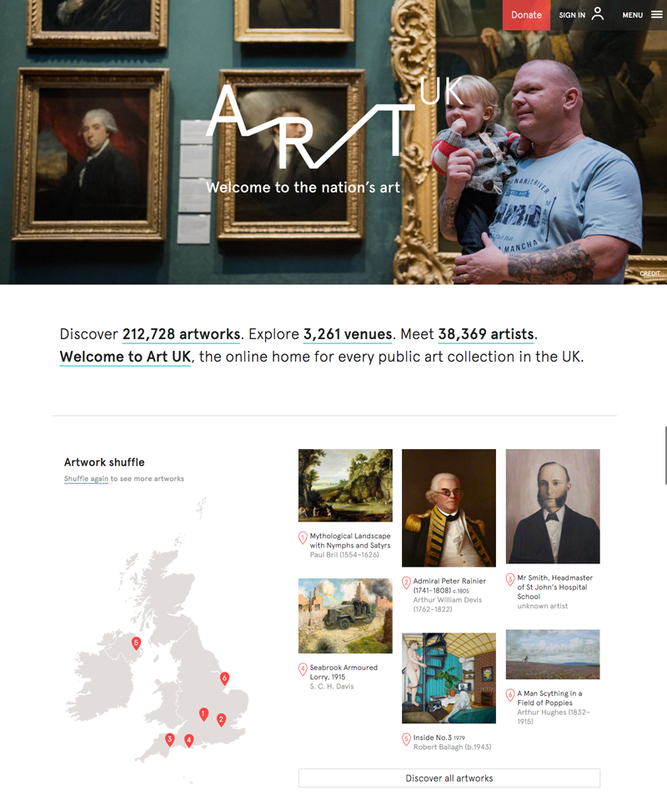 Launched only three weeks ago, Art UK has already received over 200,000 unique visits. Over 2,000 new visitors have registered online and started creating portfolios, annotations and saving searches. 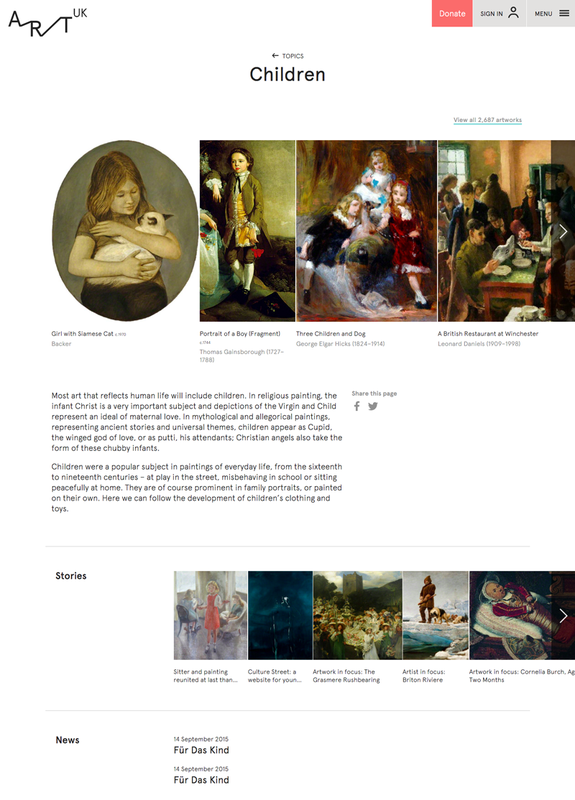 Qi by Keepthinking is the Integrated Content and Collections Management System that holds all the data published in Art UK, including Art Detective and Tagger. Qi integrates using its API with the ElasticSearch enterprise search engine. Artwork information as linked open data will be available later in the year. The website is designed and developed by Keepthinking (http://www.keepthinking.com). Knowledge Integration (http://www.k-int.com) is responsible for the ElasticSearch integration. Pentagram (http://www.pentagram.com) developed the Art UK brand identity. Intelligent Heritage (http://www.intelligentheritage.com) is responsible for project management and strategy. Art UK has a 20-strong steering committee made up of experts within and outside the museum sector and reflects that this is a massive collaboration across 3000+ UK institutions. It includes representatives of Tate, National Gallery, National Galleries of Scotland and National Trust, among others (http://artuk.org/about/advisors).